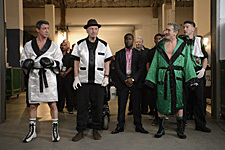 Warner Bros. Pictures has released the trailer for director Peter Segal’s Grudge Match, starring Sylvester Stallone, Robert De Niro, Kevin Hart, Alan Arkin, Kim Basinger, Jon Bernthal and Camden Gray. In Grudge Match, De Niro and Stallone play Billy “The Kid” McDonnen and Henry “Razor” Sharp, two local Pittsburgh fighters whose fierce rivalry put them in the national spotlight. Each had scored a victory against the other during their heyday, but in 1983, on the eve of their decisive third match, Razor suddenly announced his retirement, refusing to explain why but effectively delivering a knock-out punch to both their careers. Thirty years later, boxing promoter Dante Slate Jr., seeing big dollar signs, makes them an offer they can’t refuse: to re-enter the ring and settle the score once and for all. Grudge Match opens in theaters on Christmas Day.